A cylinder (geometry) is one of the most basic curvilinear geometric shapes, the surface formed by the points at a fixed distance from a given straight line, the axis of the cylinder. The solid enclosed by this surface and by two planes perpendicular to the axis is also called a cylinder. 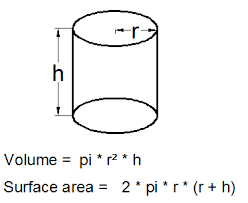 By this calculator users can get volume and surface area of cylinder.